Vancouver writer John Thomson specializes in architectural issues, urban design and travel. He writes for broadcast, print and the Web. Living walls or vertical gardens are banks of plants fixed to a wall. Until recently, they were usually built outdoors. 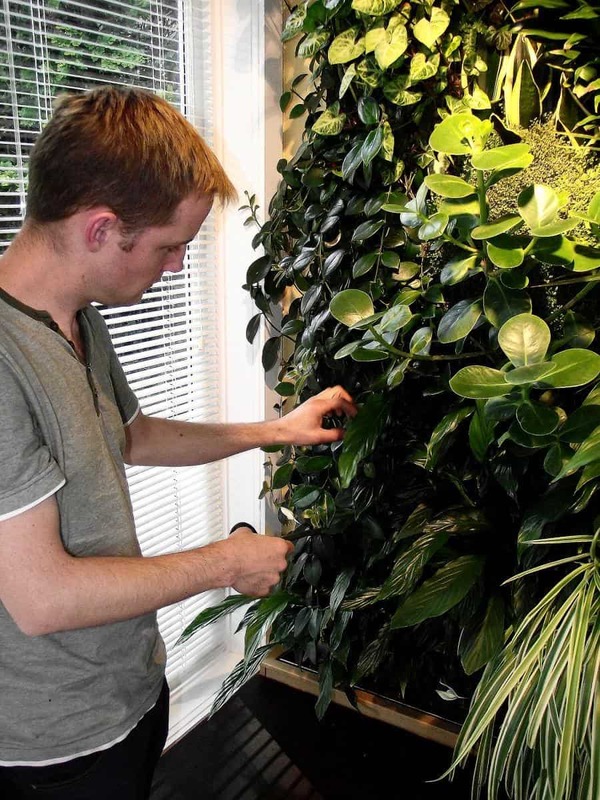 But now you can improve your air quality and create an impression inside with an indoor living wall. "A living wall emits moisture and oxygen," says Heather March, a landscape designer with Greenstems, a Gastown floral studio. March has installed 20 living walls for businesses and residences in Vancouver's downtown core, most of them concerned with decoration and air quality. "Plants are more efficient than mechanical air filters," adds Mike Weinsmaster, the chief designer with Green Over Grey, another Vancouver company specializing in living walls. He quotes a NASA Clean Air Study that says 15 to 18 houseplants will help scrub the air of toxins. 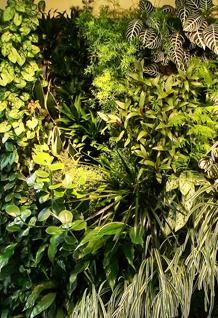 A living wall will easily accommodate 20 species or more. In additional to purifying the air, March says the same study shows that living walls dampen noise, warm up a room and free up floor space, an important consideration in her part of town where small, industrial-looking condos are the norm. And let’s not forget the wow factor. "Anybody who comes in goes ‘oh that’s fantastic,'" says Barb Small, who recently installed a 6 x 6 foot living wall in the entrance way of her Vancouver home. 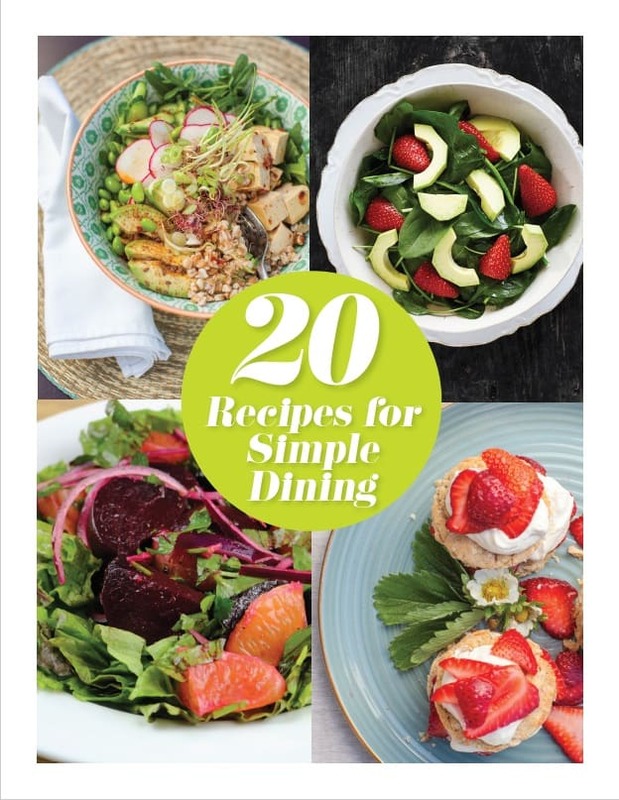 "People love it. At least 80 percent of people comment on it," she says. So how do you get your plants onto the wall to earn those rave reviews? Imagine a wall of waterproof envelopes or totes. They’re called woolly pockets but they really feel more like a mix of felt and rubber than wool. The concept is simple enough. 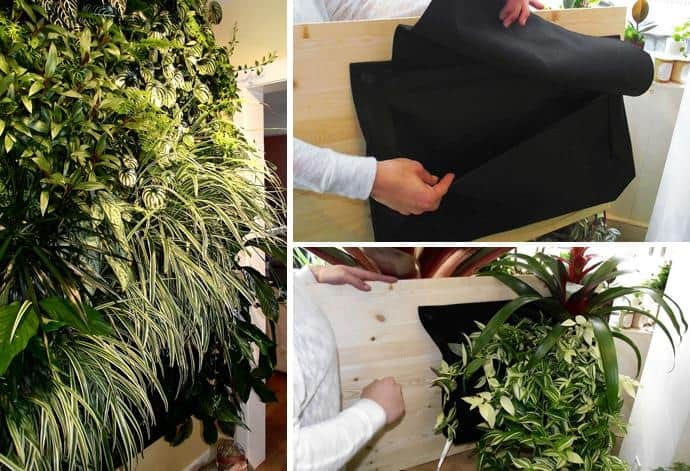 Screw the fabric onto the wall, put soil into the pocket – the standard 15”x 24” pocket can hold up to 0.4 cubic feet of potting soil – add plants, water as necessary and voila... instant garden. Each pocket is lined with a moisture barrier that protects the wall from getting wet. The surface water will slowly evaporate so make sure you keep watering. The most common mistake is under watering. A small reservoir of water collects every time you water and the fabric wicks the water to the plant’s roots. The pockets and the space between them are visible unless you use a lot of trailing plants to hide the fabric. Individual pockets are relatively cheap and can be installed quickly without doing anything to the wall. The hydroponic system is a more sophisticated system comprised of a growing medium, micro plumbing and drip irrigation. Plants don’t sit in soil but root themselves into a manmade fabric that looks and feels like an under carpet. A mixture of water and nutrients is piped to the top of the structure and percolates downwards, feeding the roots. This means less work – the system looks after itself – but it also means installing a water pump and the cabinetry to house it. No fuss, no muss, everything is automatic. The system waters the plants for you. The irrigation system requires a separate pump and housing, and the Ph level has to be monitored. Roots are free to grow and interlock with each other and will eventually create a stronger structural support. Because there are more elements to hook up – the frame, the vapour barrier, the synthetic fabric that sits on top of the barrier and an irrigation system, a hydroponic system takes longer to install than pockets. There is no fabric showing through so the wall looks unbroken and cohesive. The cost of a living wall depends on its size. 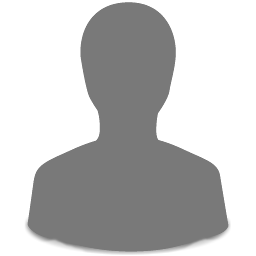 Greenstems provides a total service including consultation, installation, plants and initial maintenance for $125 - $150 per pocket. Green over Grey charges the same amount per square foot for its hydroponic system, but cabinetry to house the pump is extra. Individual pockets can be purchased from Greenstems or Art Knapp for $60 each if you want to do it yourself.